Barack Obama and George W. Bush differ in many ways, but both have embraced so-called “clean coal” for providing an ongoing supply of cheap and readily available energy for electricity generation. The term “clean coal” is loosely defined as coal that is washed or processed to remove pollutants, so as to reduce emissions of carbon dioxide (CO2), the leading greenhouse gas, when the coal is burned. Coal-burning plants emit 40 percent of U.S. CO2 pollution—half of our electricity comes from coal—so reducing the industry’s carbon footprint in any way possible would be a big win for the environment. Luckily for clean coal advocates, the White House has been and continues to push for its development. George W. Bush’s support for clean coal dates back to his first term in office, when he stated that such technologies should be encouraged as a means of reducing dependence on foreign oil. And since taking office, the Obama administration has committed $3.4 billion in stimulus dollars to clean coal projects. According to Greenpeace, burning coal emits 29 percent more CO2 than does burning oil or natural gas. And coal-fired power plants are the world’s largest sources of atmospheric mercury, a known neurotoxin that disperses quickly throughout the environment and into the food chain. 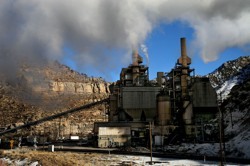 Greenpeace says that clean coal technologies will not address this problem, and that there are “no commercially available technologies to prevent mercury emissions from coal-fired power plants.” Also, the group says, clean coal will do nothing to mitigate coal mining’s damage to wildlife habitat and drinking water sources. The Reality Coalition, a group of nonprofits that includes the Sierra Club, has been running TV ads seeking to debunk industry claims that coal can be clean. Green groups also worry that pushing clean coal will only delay the transition to a truly cleaner and greener energy infrastructure based on solar, wind and other emissions-free renewable energy sources. Of course, Obama’s support for clean coal doesn’t negate the fact that he has proposed spending much more on further development of alternative energy sources. He has called for getting 10 percent of U.S. electricity from renewable sources by 2012 and 25 percent by 2025, and has committed upwards of $32 billion of stimulus dollars to the cause, according to an analysis by the nonprofit Environment America.